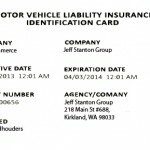 The National Motor Vehicle Title Information System (NMVTIS) is an initiative from the federal government designed to keep stolen vehicles from being sold. Its main purpose is to prevent the reintroduction of stolen motor vehicles into the market. 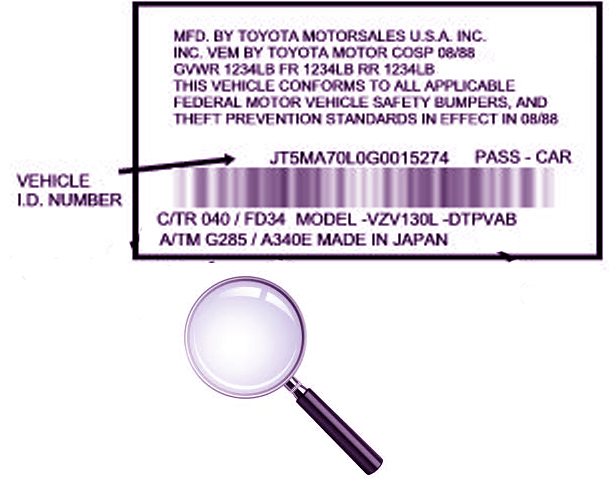 NMVTIS was instated to protect consumers from vehicular fraud and unsafe vehicles. It also serves as a tool for law enforcers to deter the sales of fraudulent titles and reduce the incidence of crimes involving the use of stolen automobiles. It serves as reliable electronic system that can be used as a tool by titling agencies to instantly verify the information on the title records with the data from the issuing state. The NMVTIS provides commercial and individual consumers with an accessible means to retrieve important vehicle history information such as title data, brand history, odometer reading, total loss history and salvage history. Car theft and fraud was a growing problem in the early and mid 1980s. Despite the enactment of the Motor Vehicle Theft Law Enforcement Act of 1984, car theft was still a major problem by the early 1990s. Before the 1990s, car-theft and auto fraud-related crimes still carried minor charges and lighter sentences. Investigators during the time had also believed that inscribing or affixing the Vehicular Identification Number (VIN) onto the engine, the transmission and 12 major body parts of the auto provided them with enough tool to detect, apprehend and prosecute car thieves. The parts marking allowed law enforcers to identify stolen vehicles or parts removed from stolen vehicles. It also served as a deterrent for professional car hustlers since it introduced a greater risk for capture and increased difficulty in reselling marked parts. Parts marking officially began in 1987. Despite this initiative, a survey in 1992 revealed that the reported incidence of car theft had only grown from 830,000 in 1984 to 1,270,000 in 1990. Increasing incidences of violent carjackings resulting in fatalities were also reported nationwide. In the aftermath of a series of carjacking incidences where several victims were murdered, the US Congress was called into action. Pressed to search for a stronger solution for the problem and in response to the Department of Transportation’s recommendations, the Congress passed the Anti Car-Theft Bill into law. It was the first federal carjacking law which criminalized the usage of firearms and force in stealing a motor vehicle. 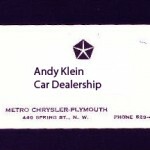 After it was passed into a law by the Congress on October 1992, Title II of the Anti-Car Theft Act mandated the United States’ Department of Transportation to develop a national information system which would enable states and other stakeholders to gain access to automobile titling information by January 31, 1996. The Act was primarily designed to tackle the increasing incidence rate of automobile-related robberies and criminal activities. It was enacted to decrease the trafficking of illegal and stolen vehicles and protect consumers from fraudulent vehicular titles. In order to fulfill its responsibilities, the DOT delegated the task to the National Highway Transportation Safety Administration (NHTSA) on April 25, 1993. The NHTSA, in turn, formed a task force known as Motor Vehicle Titling, Registration and Salvage Advisory Committee to spearhead the development of NMVTIS. (3) penalties to enforce compliance. The Department of Transportation accepted most of the recommendations and sent the proposed legislation to Congress with the request of extending the deadline for the implementation of the NMVTIS to October 1997. The extension request was made under the grounds of conducting a pilot run for the program.Around the same period of time, the American Association of Motor Vehicle Administrators (AAMVA) was also appointed as NMVTIS’ system operator. In order to facilitate the development of the NMVTIS, the AAMVA requested funding for a pilot study from the NHTSA. Unfortunately, this request was denied despite the $890,000 congressional appropriation. On November 29, 1995, then-New York Representative Chuck Schumer, who was a member of the House Judiciary Committee at the time, called for the General Accounting Office (GAO) to evaluate the implementation status of NMVTIS. In order to send the progress of NMVTIS further forward, the House Resolution 2803 (Anti-Car Theft Improvements Act) was introduced on December 1995. This allowed the transfer of the jurisdiction over NMVTIS from the Department of Transportation to the Department of Justice. It also granted the original deadline extension request made by the DOT and provided immunity to participants (e.g. systems operators, insurers and salvagers) who make good faith efforts to comply with the law. GAO was finally able to comply to Rep. Schumer’s request on April 22, 1996 and published the report entitled “Anti-Car Theft Act: Implementation Status of Certain Provisions of the 1992 Act”. The report elaborated that both DOT and DOJ failed in developing the NMVTIS within the deadlines provided and recommended for certain measures to be taken. On July 23, 1998, Senator John Ashcroft, who was then the Chairman of the Subcommittee on Consumer Affairs of the Senate Commerce Committee, expressed concerns over the NMVTIS.After meeting with Carfax, Sen. Ashcroft called the system a “Washington boondogle” and requested GAO for a comprehensive report on the implementation status and projected costs and benefits of NMVTIS to ensure that additional government investments are justified. GAO responded on August 13, 1999 and issued the report entitled “Anti-Car Theft Act: Issues Concerning Additional Federal Funding of Vehicle Title Information System” which concluded that the Department of Justice has not performed a cost-benefit evaluation for NMVTIS and that such an analysis must be conducted. It was only in 2001 that the Justice Department evaluated NMVTIS, through its own cost-benefit analysis, and declared the system as a profitable investment for federal funds. The 1999 GAO report also included AAMVA’s projected estimate of $34 Million which will cover the development and implementation of the system. 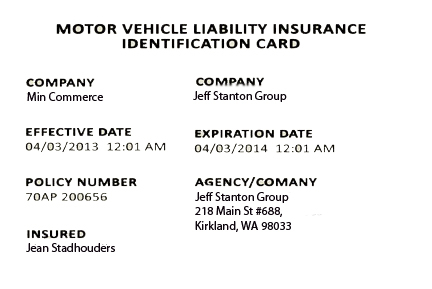 The AAMVA was able to report in 2000 that the vehicle title information system it developed is capable of fulfilling the requirements set by the ACTA. However, the association identified funding as the main barrier for the implementation of the program across all states. It also noted that the participation of junk yards and car insurance companies in reporting car fraud incidences was significantly hindered by the Justice Department’s failure to issue the regulations required by the Act. The NMVTIS provides a means of verifying whether or not a title is valid. 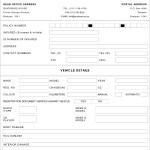 It also provides the information of the vehicle’s reported mileage, where a vehicle bearing a known VIN is currently titled and whether the vehicle is currently reported as junk or salvage. Currently, all states and jurisdictions are required to participate in reporting to the NMVTIS. The system does not include data on owner information and any other DPPA information. It covers motor vehicles only (e.g. trucks, cars, mopeds, motorcycles and buses) and does not include trailers/semis, golf carts, ATVs and off-highway machineries. Currently, a substantial increase in the number of participating states has been been observed. Right now 96% of the US Department of Motor Vehicle Data is represented in the system. There are 6 states that is in development along with the District of Columbia and it will be soon until the remaining states are included. If you are out on a quest to buy a used car here are a few things that you should know before you go out and begin the hunt. The following documents will help ensure the car you buy is safe, legal and in a reasonable condition. 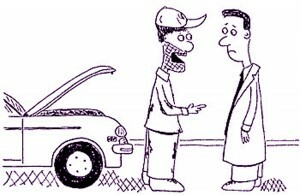 Before any purchase or commitment is done, the buyer must properly inspect the car. Viewing the car in daylight is highly recommended. 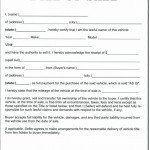 The buyer should receive the following documents and information from the dealer before any agreement can be done. The Buyer’s guide is a document that every seller must provide to a buyer. 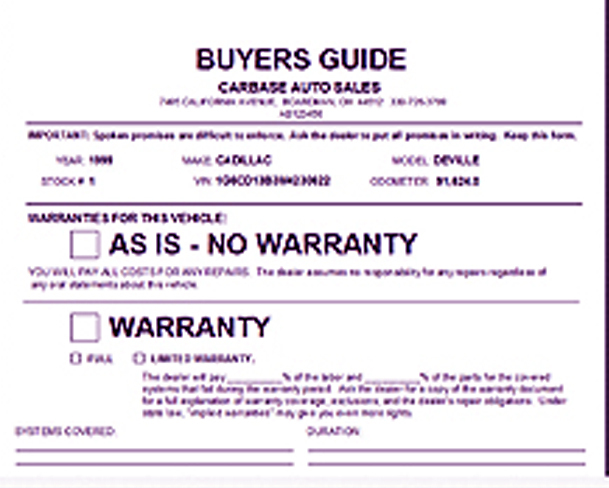 It contains crucial information about the purchase history of the car and whether the car comes with a warranty or not. 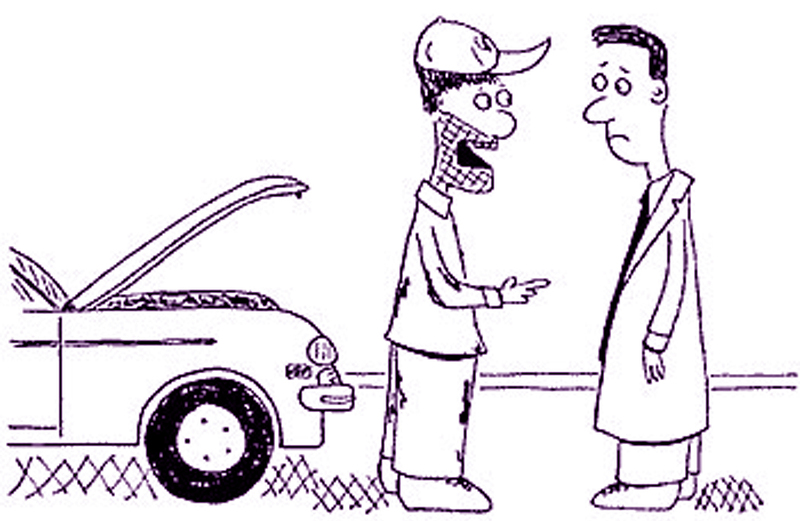 It should contain the major issues about the car that the buyer should be prepared for and the cost of repair the dealer is willing to pledge under warranty. The guide is also a reference that should be kept after the sales. 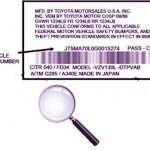 The Vehicle Identification Number (VIN) should be provided to the buyer before the sales. The code indicated in the document should match with the etchings found on the car’s chassis (location may vary) in order to check if the car has been rebuilt sometime in its history. The VIN is also necessary in obtaining the vehicle history report from the DMV to verify if the vehicle had ever been reported as wrecked or stolen. This information should also be supplemented by the car make, car model and model year. 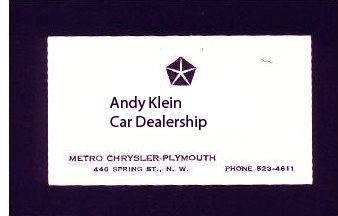 The dealer’s name and contact information should be made available to the buyer. This should be printed or included in the Buyer’s guide. 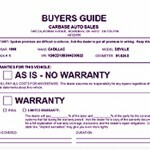 Although typically included in the Buyer’s guide, warranty certificates (if there are any) should be provided by the car salesman. It should be able to indicate whether the warranty is Full or Limited, as well as the percentage of repair cost that the warranty can cover. Manufacturer’s warranty, if still applicable, should also be included with the documents. After validating the condition of the car and the package that it comes with, the following documents should be prepared by the dealer in order to finalize a purchase. 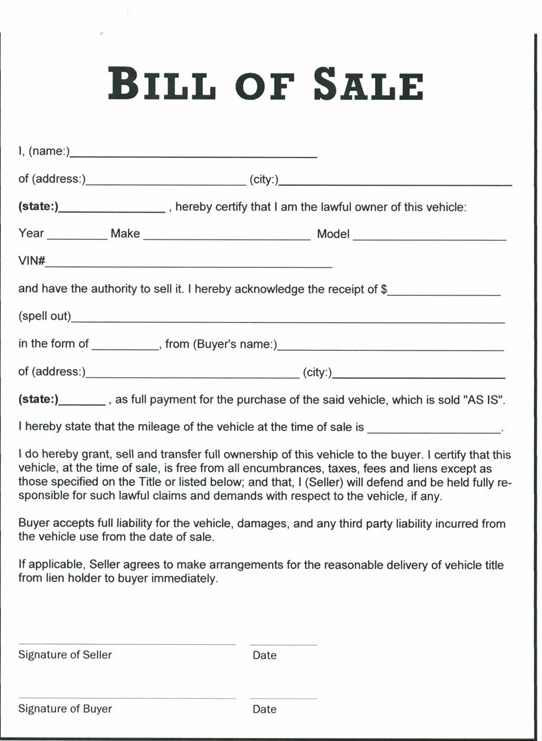 A bill of sale is a document that serves as the record of a car sale. 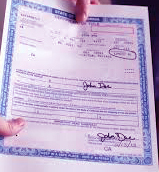 Although it is not required in all states, the buyer should still be provided with this document as proof that the purchase has indeed taken place. It should contain the date of sales and dealer information. It should also include the purchase price, vehicle type and other information such as odometer reading. A bill of sale does not prove ownership though and a title transfer must be secured in order to fully give ownership of the car to the buyer. 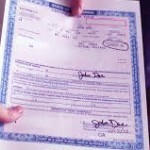 The car title is the most important document a buyer must receive from the seller during a car sales. It is the most crucial requirement for a title transfer and must be secured by the buyer no matter what. Compared to buying a brand new car, applying for a title transfer of used cars requires more effort. Dealers usually help a lot in applying for title transfers since they are the ones responsible in providing the necessary documents, but the filing of the application is the buyer’s responsibility. The requirements for a title transfer vary from state to state but it usually includes a title transfer application form, odometer reading, the VIN, bill of sale and the title certificate. 3. Clearance from the institution that has financed the vehicle. In cases wherein the seller has originally bought the car under a financing, a “Notice of Security Interest Filing” must be submitted. 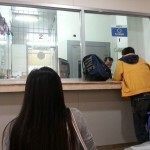 This is done in order to prove that the lien has been satisfied and that the seller has no withholding obligations in the financing institution. A letter from the financier will also be sufficient enough in cases where a “Notice of Security Interest Filing” is not available. After the payment has been done, the buyer’s priority shifts from securing the documents that prove his ownership of the car to legally transferring the title of the car under his/her name. 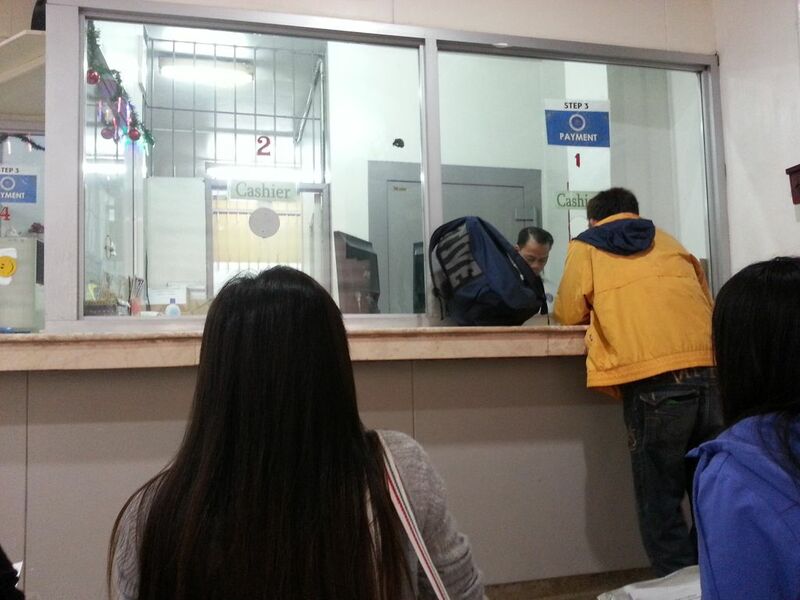 The Department of Motor Vehicles is the government agency involved and these are the typical requirements they impose to register a recently purchased secondhand car. All cars that undergo the registration process must be duly inspected first for any safety issues. Licensed inspection stations are scattered across cities and counties, and even the dealer could be an authorized inspector. Some inspection certificates are valid for 90 days or even longer. This must be secured prior to registration and the dealer should be able to provide the buyer with enough information on how to secure one. 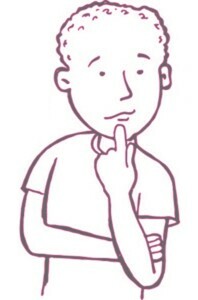 If the buyer holds a driver’s license from any American state, he/she can apply for a policy from any insurance company. Foreign license holders are either asked for higher premiums or required to convert to a local license. 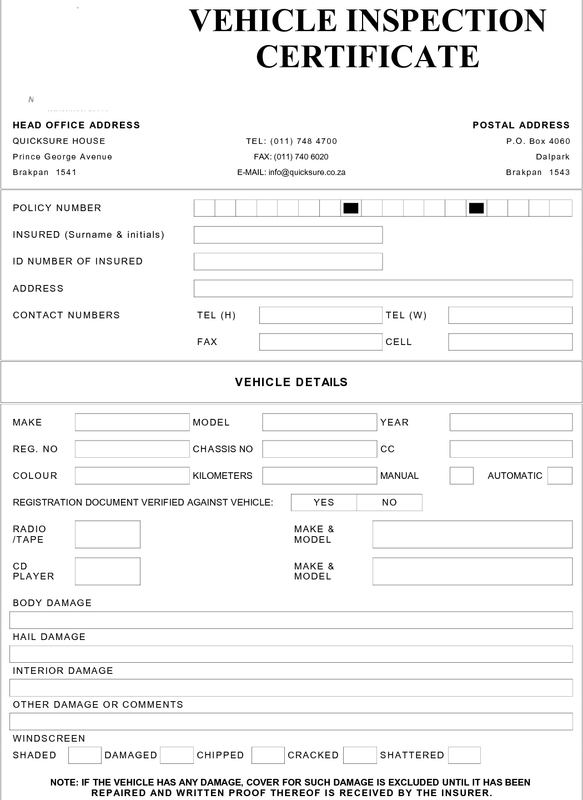 Cars which passed inspection could apply for a temporary registration. Temporary registrations could be valid for 30 days from the issuance date and may be purchased after settling the necessary fees. The temporary license allows the buyer to provide the necessary repairs to the car and transport it to its destination. This is definitely a must know if you are the type who would always like to be a step ahead. This will help you come up with your negotiation strategy and it will send a bold warning to the salesman that you are not a pushover and that you are prepared. Remember, “the well prepared warrior always gets the victory”. When you’re going out there always think that you’re a warrior and your victory is getting your desired car at a reasonable price.